What is responsible and ethical investment? The UNPRI has developed six principles for responsible investment. Hundreds of asset owners, investment managers and professional service partners have signed up to the principles. Some organisations have provided reports against the principles. 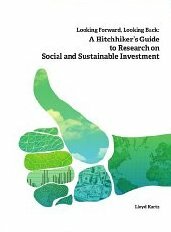 In February 2013, Lloyd Kurtz of FSinsight published an e-book, “A Hitchhiker’s Guide to Research on Social and Sustainable Investment”, which provides a succinct overview of research on social and sustainable investment over the last thirty years or so. It includes a section reflecting on approximately 100 studies that have been conducted since the global financial crisis. The guide is divided into two parts. The first part consists of an essay by Lloyd Kurtz covering the first three decades of research into social and sustainable investment. The second part bundles articles on all the studies and books that Lloyd Kurtz mentions, plus references to the online libraries where this research can be found. Almost all articles in the second half of this guide have also been published on fsinsight.org. Resources such as the OECD Guidelines for Multinational Enterprices and the OECD Declaration and Decisions on International Investment and Multinational Enterprises (signed on 4 May 2010 by the governments of the 42 OECD and non-OECD countries).